A team of pilots and a medical worker are in the midst of evacuating a sick staff member from a science base near the South Pole. The rescue attempt is considered treacherous given the extreme midwinter temperatures and distances involved. An unnamed staff worker at the National Science Foundation’s Amundsen-Scott South Pole Station has become seriously ill. The medical situation is serious enough to facilitate a perilous midwinter rescue—a time of year when dark and cold conditions make routine flights treacherous. This is apparently just the third time this has ever happened. For privacy reasons, the nature of the medical emergency has not been made public. What we do know, however, is that the patient is seasonally employed through the Lockheed Martin Antarctic Support Contract, and that their illness could not be managed at the station. After consulting with outside medical professionals, the team decided that an emergency rescue was required to get the patient to a hospital in South America. Easier said than done. This isolated base is located near the South Pole, about 1,500 miles from Rothera, a British Antarctic Survey Station on the Antarctic Peninsula. It takes about 9 hours to get from Rothera to the NSF base—a distance of over 1,500 miles. And as already noted, it’s now winter in Antarctica, where temperatures can drop to -60 degrees C.
For the rescue, a pair of Twin Otter aircraft were deployed to Rothera. 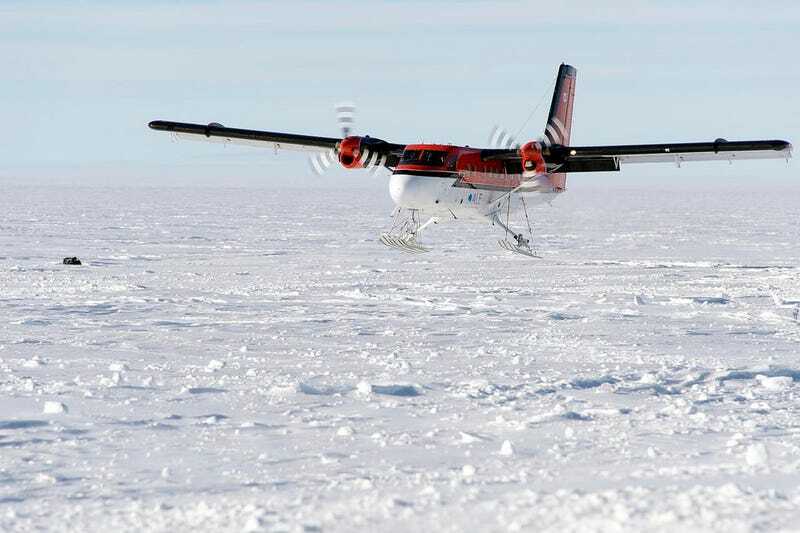 These are the only planes in the world capable of withstanding midwinter Antarctic temperatures. Prior to taking off, the fuel, batteries, and hydraulics need to be warmed. Importantly, these bad boys don’t require a runway for landing. Earlier today, one of these planes landed at the South Pole base and evacuated the patient (the other plane is there strictly as a backup). It’s now airborne once again, making its way back to Rothera. From there, the plane’s three-person crew and one medical team member will rest before embarking to South America.